Harry Hole, an ex-detective from the Oslo police, has been living in Hong Kong for three years. He returns to his native city when he hears that someone close to him has been arrested for the shooting and killing of Gusto, a young junkie/drug-dealer. His ex-boss seems keen to encourage Harry to return to his old job, but Harry simply wants to investigate this one particular case. Over the next few days, Harry begins to uncover the details of the Oslo drug scene. He soon finds out that the main supplies are controlled by “Dubai”, so named because he employs street boys wearing Arsenal football shirts to sell his product (“Fly Emirates” is written on the shirts). Dubai is also known as the Phantom because nobody knows who he is or where he lives: he is said to wander the streets like a ghost. The product his “employees” sell is “violin”, a synthetic product derived from morphine that is more addictive than heroin – Harry receives a chemistry lesson about the drug from a couple of doctors at the nearby Radium hospital, where it is made and prescribed to terminally ill patients. Harry’s mission is to find who really killed Gusto. He soon finds himself overwhelmed with suspects, from the head of the drug squad and/or his second in command (two old adversaries), to an ambitious councillor, through to Gusto’s relations as well as various rival drug-dealers and low life. Gusto himself has an active role in the novel as he experiences his final moments and looks back on the events of his life. The two narratives come together to form a typical Nesbo climax, which leaves readers on tenterhooks. Phantom is a great, page-turner of a read, uncluttered by the over-complication that sometimes slightly mars earlier novels in the series. Don Bartlett, as ever, provides a superb translation, sensitive to Harry’s particular brand of humour as well as to the seamy lowlife and their in-jokes about London football clubs and the like. Yet there are certainly some oddities, even flaws, in the novel. Harry, for example, is so fixated on his mission that he does not seem to do anything or even care about some of the widespread corruption he uncovers. He is too much of a superman in his unpreparedness for meetings with people he knows may have cause to want him out of the way, and indeed some of the methods he uses to pursue his goals, such as getting the city’s power supply instantly turned off so he can attempt to escape when cornered by some baddies, or sewing up his own cut throat and chin. The author sets up some situations purely, it seems, to provide an inventively horrible (if mercifully fairly brief) set-piece rather than to advance the plot or provide insights about the characters. Yet, Phantom is a telling book, with a powerful message about what addiction can do to people’s lives (three young lives in particular), and conveying with equal depth the blindness, and therefore dangers, of love. I thank Karen of Euro Crime for lending me this book. Read other reviews of Phantom at: Euro Crime (Karen Meek), Crimepieces, The Independent, The Crime Segments, Crime Watch, The Game’s Afoot, and many more. 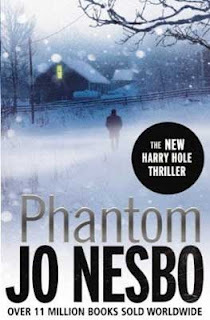 Euro Crime: the Harry Hole series in order, with links to reviews of each book. Author’s websites: UK and everywhere (including UK!). I agree about the humour Maxine. The bit where he sews up his neck really maded me laugh. There is a ‘superman’ aspect about Harry Hole that doesn’t ring true and I guess this could be compounded by how the author approaches the next book given the ending of this one. Glad you liked it though! Sounds like a must-read to me. Will put it on the TBR mountain and hope to get it soon. Maxine – An excellent review as ever! I’m so glad you brought up the humour in the Harry Hole novels. It’s sometimes subtle but it’s there. It’s good to hear that this one isn’t either as convoluted or as brutal – well, graphic – as some of Nesbø’s work has been. I’m waiting my turn at the library for this one and looking forward to it. I liked this one a lot — the humor took the edge off the bleakness of the story. I could totally picture Harry with tape around his neck, already looking like Frankenstein’s monster. The focus on addictions was incredibly depressing. While I enjoyed most of The Phantom very much, including Harry as the Lone Wolf – an independent investigator, not confined to the role and rules to which police detectives are bound, I thought some elements of the story would have better fit a graphic novel. Because Harry was not a cop in this one, he had to get a rather incredible amount of information from a limited number of inside sources, a real stretch I thought. Then there was the “Jim Beam” rescue. Now really, that is just not feasible ! And the JB scene played out in my mind like a To Be Continued from “Flash Gordon” or “Perils of Pauline”.. But what I thought was really out of the old time serials was the ending….a triple cliff-hanger if you will. And the baby rats, what happened to them?! Guess I’ll have to read the next one. Oh, and is someone going to advise that poor doofus who wrote the rather off review in Amazon UK that there will be a next one?. Ken- I agree for sure that the Jim Beam scene was another example of “superman”, totally implausible – it simply would not work with a rigid glass body. The rats were so much in the build-up that I thought something would have to come of them! Yes, the ending certainly is a cliffhanger – must check out that amazon review. I agree that the book has many flaws and silinesses, but a the same time, readable….despite all the expositions & too much detail (eg in the airline pilot subplot). Although this book is long objectively, Bernadette, I can’t believe how quickly I read it – it just races by. Yes, you can read this independently of the other books. The only downside is that readers have become previously involved in Harry’s on/off relationship with Rakel and her son Oleg, so if you read this book without having read the earlier ones, this aspect might not seem so involving. There is no reason other than that why you need to have read any of the others – Nesbo writes them to be self-contained, though it is best to read The Redbreast before The Devil’s Star. (Nemesis comes between those two but is mainly separate from the arc of the two books surrounding it). Any of them, apart from those two, can be read independently of each other, in my view. I read Nemesis without having read any books by Nesbo before that. I raced through it, couldn’t put it down, thought it was one of the best thrillers I ever read, an intelligent thriller. I was in awe of his construction of two different sets of murders which intersect and the character of the jailed Roma gangster; his chess scenes with Harry were quite something. Nemesis put Nesbo up high on my recommended list of thriller writers. It’s far more than just a plot. It’s intelligent, socially conscious , has character development — it’s quite a ride. I was in Norway racing along with Harry throughout the pursuit of the culprits. And he keeps one guessing until the last taut page. A winner. I’m glad Phantom is also of this quality. I didn’t feel the same way about Devil’s Star, plus I guess the culprit early. I read The Leopard last year, and I thought it is good but not fantastic. If you say Phantom is better than Leopard, I may try it. Jo Nesbo is writing so fast, I can’t keep up with him! Thanks for the review Maxine.